It was with great sadness that the Crosslé Racing Drivers Club heard of the passing away of John Crosslé after a short illness. Formed in 1957 after numerous requests for John to build copies of his successful 1172cc Ford powered specials, the Crosslé Car Company, is, we believe is the oldest racing car company in continuous production in the world. In fact 2014 is proving to be a good year, with sales of the late run 9S sports racing car up on last year. 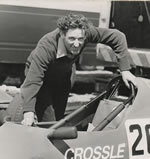 John Crosslé steered his company to success with cars that had a reputation for high build quality, reliability and a generally driver friendly handling characteristic. A fact which ex F1 drivers such as John Watson, Nigel Mansell, and Eddie Irvine would I am sure agree with. The cars most associated with John Crosslé and the Crosslé Car Company is always likely to be the Formula Ford, as they had great success with a number of models such as the 16F, 19F and of course John’s personal favourite the 25F. Today the company is run by long time enthusiast and Crosslé race car owner/driver Paul McMorran who we are sure will do his best to secure a long term future for the factory and all the race cars The Crosslé Car Company have produced in their 57 years of production..
Gwyn Pollard is hot mustard in Dijon!